According to the latest data from Localytics, Christmas shoppers were heavily focused on obtaining Apple products this year with iPads and the iPhone XR dominating the list of devices activated for the first time during the holiday season. The new sixth-generation iPad clearly saw the highest increase in activation volume at 219%, while the 11 inch iPad Pro came in at second with a 125% increase versus the prior weeks in December. 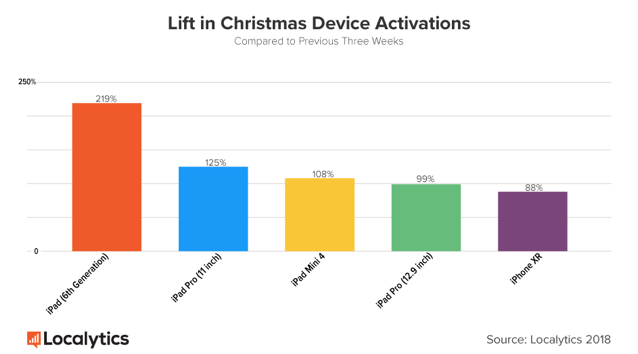 Last year, the Google Pixel 2, Pixel 2 XL, and the iPhone 8, 8 Plus, and X took the top five spots on the list of new device activations in the days surrounding Christmas whereas this year, the iPads have returned to the top of the list since 2016, nearly sweeping the top five. 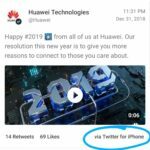 Meanwhile, the iPhone XR, which saw more new device activations than any other device over Black Friday weekend, continued to perform the same during the holidays which further confirms the demand for low-priced iPhones. iPads were heavily promoted this Christmas in the form of deals from Amazon, Walmart, and Target, where consumers saved $100 on the 32 gigabyte model and $80 on the 128 gigabyte model. Stores also offered deals on the 12.9 inch and 11 inch iPad Pro. At the same time, Apple’s market strategy for the XR seems to be paying off: A study from Consumer Intelligence and Research Partners found that significantly more consumers switched from an Android device to an iPhone within 30 days of the XR’s launch than those who switched to the iPhone X from an Android device in its first month. 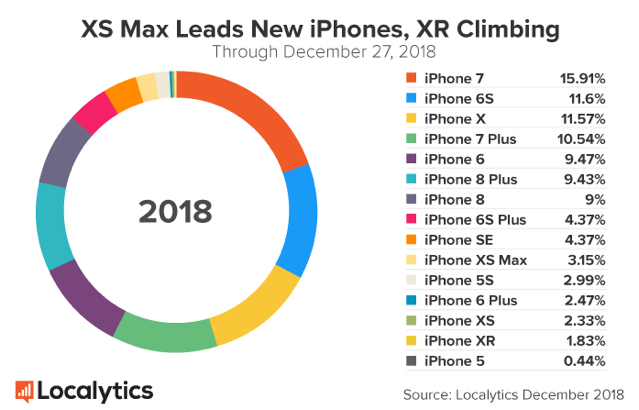 Despite multiple reports of less than expected market demand, the iPhone XR managed to have great adoption this Christmas, marking the highest lift in activations of any new Apple device in the past three years. Localytics is the leading mobile engagement platform across more than 2 billion devices and 12,000 mobile and web apps. Localytics processes 3 billion data points daily. For this analysis, Localytics examined the percentage increase in the quantity of new devices from December 24th to Dec 26th to a baseline number of new devices over the same days in the prior 3 weeks (Dec. 3rd – Dec. 5th, Dec. 10th – Dec. 12th, Dec 17th – Dec 19th). A new device is defined as a device that is seen by Localytics for the first time by downloading one of the apps incorporating our SDK. For market share data, we examined the relative percentage of each model as of Dec 27th 2018. All data in this study is based on international device usage.